It's finally the New Year - again. And, it's yet another opportunity to make that yearly resolution cliché. This year, instead of a new you, how about ditching some old energy wasting habits and having some extra money at the end of the year to show for it? Here is our top energy saving tips bound to net you some extra cash in your new year. Turn out the lights when you leave the room - If you're still using incandescent bulbs, make sure to turn them off when you leave a room or if they're no longer needed. 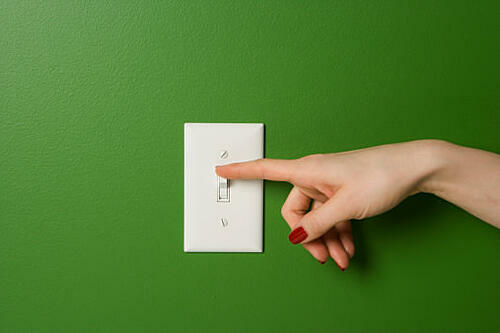 Turn compact florescent lamps (CFLs) off if you plan on leaving the room for 15 minutes or more. Since CFLs work differently, it's more efficient to leave them on if you'll need them within 15 minutes. Upgrade to energy saving lighting - Incandescent light bulbs are inexpensive, but they're also inefficient. Only about 10 percent of the energy they use actually produces light. The other 90 percent produces heat. If you were to switch out 5 of your home's most frequently used incandescent bulbs with Energy Star bulbs, you could expect to save $75 a year in energy costs. CFL bulbs can save 75 percent in energy costs and last six-times as long as traditional bulbs. Energy Star LED lights are even more efficient and longer lasting. Install a programmable thermostat - You can save an estimated 10 percent on energy costs when you turn your thermostat down 10 degrees in the winter (or up in the summer) for about eight hours a day. The easiest way to accomplish this is with a programmable thermostat. By resetting your thermostat while you're asleep or away you won't have to sacrifice your comfort. Use a power strip for electronic equipment - Many of your home electronics and appliances continue to consume electricity unnecessarily even when they're not in use, or switched on. These devices are often referred to as "energy vampires" and can cost you more than $100 a year. By plugging these items into a power strip, you can easily turn them off with one switch and stop them from wasting energy. Buy ENERGY STAR appliances and electronics - When replacing anything from a refrigerator to a computer, switching to ENERGY STAR certified products guarantees 10-15 percent less energy and water used than a standard model. When it comes to washing machines, ENERGY STAR products use around 40 percent less energy than other washers while also reducing water bills. By the way, ENERGY STAR washers also need less detergent and are gentler on clothes - thus helping save money on clothing as well. Conserve hot water - Heating water accounts for about 14-18 percent of your electric bill. To reduce your energy costs, make sure your water heater is set to 120 degrees or less and consider installing a low-flow showerhead and/or aerated faucets. Today's newer water heaters have more insulation than older models. If your water heater is more then 5-6 years, you can help stop heat loss by wrapping it with a water heater jacket. Use sunlight to heat naturally - During the colder months, take advantage of the sun's rays by opening your curtains during the day and letting the sun's light help heat your home naturally. The natural light can also help you save on the expense of artificial light. During the warm months, light-colored blinds or shades can reflect heat back outside keeping your home cooler and more efficient. Keep your ceiling fan spinning right - Using ceiling fans to circulate air can help you keep a room warmer or colder, inexpensively, depending on the direction the blades are spinning. During the winter, run your ceiling fans clockwise. This will force the warmer air near the ceiling down toward the floor to help keep you warm. During the summer, run your ceiling fans counter-clockwise to force air down and cause a wind chill effect, keeping you and your room cooler. Wait for a full loads of clothes and dishes - 70 to 90 percent of the energy used by a clothes washer goes toward heating the water. For dishwashers, it's about 60 percent. Save money and energy by running these machines only when they're fully loaded. To save even more energy on laundering expenses, consider air-drying your clothes whenever possible. Have your heating and cooling system professionally maintained - Your heating and air conditioning systems are responsible for more than half of your home energy costs. Arranging annual maintenance for both systems can help your home stay efficient as well as safe. Also, you should clean the filters for these systems monthly and replace them regularly. Get a home energy assessment - A home energy assessment can give you the big picture of where your home is losing energy and what you can do to stop it - and save money. A home energy professional uses specialized tools to measure home energy efficiency then makes recommendations on how to improve your home's comfort, air quility and overall efficiency. This process can help you save 15-30 percent or more on energy costs. You can watch a video of our home energy expert perform an assessment HERE.